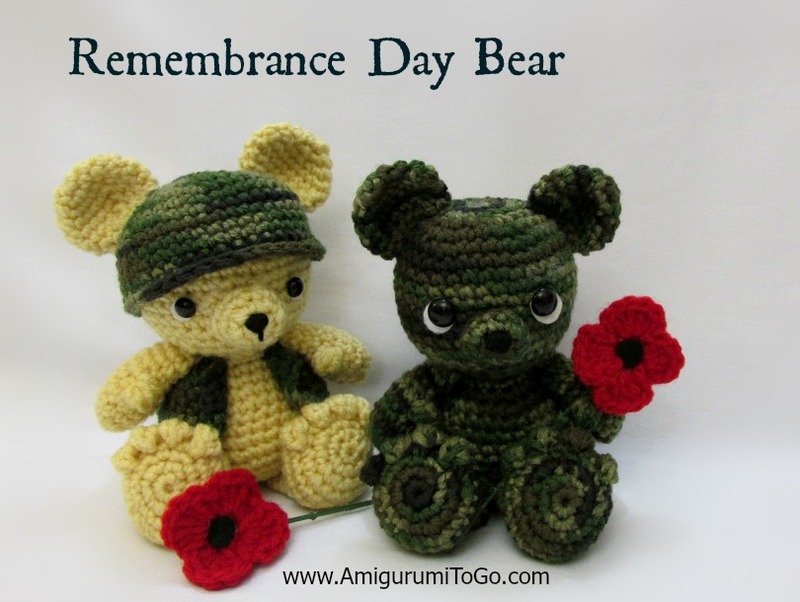 Please note you must use the same weight yarn as the camouflage yarn to make the bear in order for the vest and helmet to fit the bear. Red Heart camouflage yarn to make the vest and helmet. You must use the same weight yarn and hook size to make the bear. begin with a long starting yarn tail you will use to sew the vest to the bear. Also for rows 3-6, ch 2 and turn then start in the 3rd st from the hook. sl st into the next st and f/o leaving a long yarn tail you will use to sew the helmet to the head. Weave the yarn tail partially up the helmet. Do not sew the bottom edge of the helmet to the head. Just a few stitches around the top half of the helmet to the head will do fine. 1) place the vest around the bear and see where the arms will look best. Sew the arms directly to the vest then sew the vest to the bear. 2) place the helmet on the head with the larger rim of the helmet facing front and center. 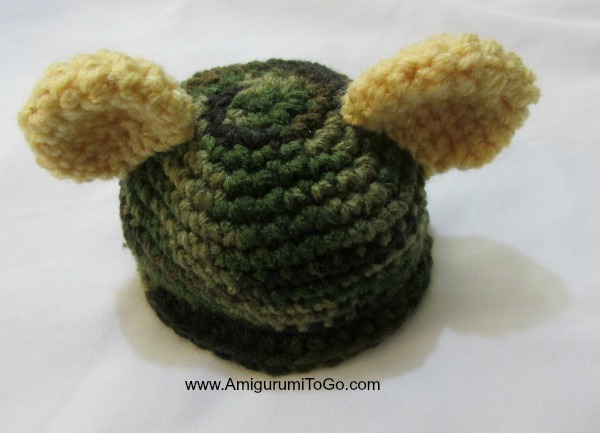 Place the ears on top and see where they will look best. Sew the ears to the helmet then sew the helmet to the head. 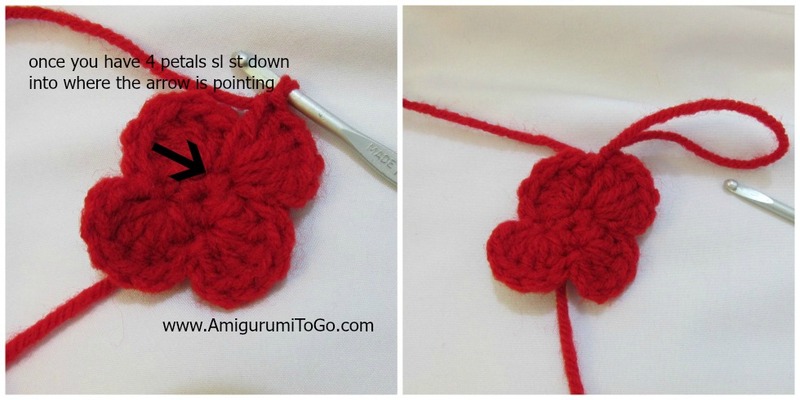 Poppy: you can begin with black yarn and switch to red when you make your first sl st but to save time just use a small piece of black felt and glue it to the center of the poppy. Use hot glue or fabric glue. You can also sew it to the center if you'd like but gluing is faster. 2) sl st to the first st then ch2 and put 5dc into the same st. Repeat these steps until you have 4 petals.. you skip 2st as you work and it doesn't matter which 2 because there's 6st and you will only work in 4 of them. sl st into any space of row 1 when you're done and f/o. I hot glued my poppy to a plastic flower stem that I stripped of its original flowers. 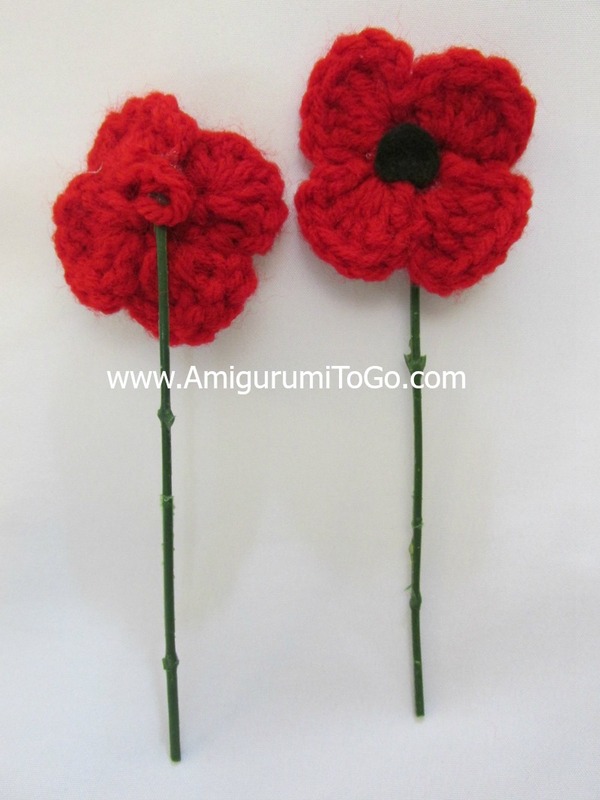 You can also use florist wire, a stick or just attach it directly to the bear. And that's it! I hope you enjoyed the patterns. Wonderful ♥thank you so much !!! I'm so glad you like the Bears, that means a lot! Hello Thank you for your patterns. There are greate and easy to ,,read''I dont now how to say it ) I made this bear for my friend.do you have some idea how to crochet a rifle? Hey Sharon, I have only recently become hooked on crochet, before I was a nutty Knitter. Your patterns and video tutorials are amazing and so easy to follow. Thank you so much for everything you have done and shared with us. I think I'm going to make this for our USO IN Stuttgart! So adorable!